Which female star is the best looking even after combed up the hair? On March 3rd, a post with the title of “Big gathering of beautiful actresses without bangs” appeared on a Internet community forum. One of the beauty is actress Han Ga In. Han Ga In combed up all her hair in MBC drama series The Moon that Embraces the Sun, the look without the fringe is still beautiful. The second beauty is beautiful figure skater Kim Yu Na. Although Kim Yu Na is not an artist, but her hairstyle in every competition has always been combing up her hair, the look is still beautiful. 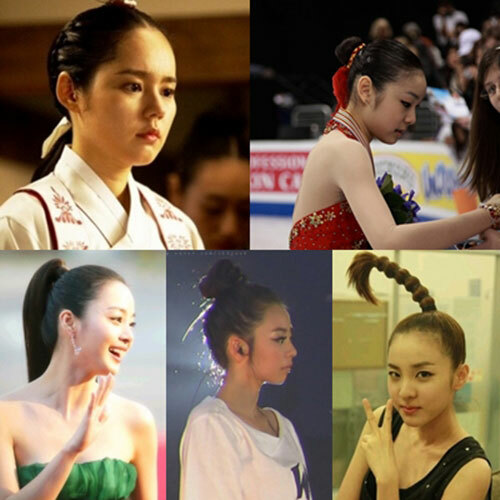 Besides, Kim Tae Hee whose face is ultra small but facial feature is perfect, Wonder Girls’s Sohee whose not only face is small but has perfect body ratio, and 2NE1’s Sandara Park who often appears in strange hairstyle, are universally acknowledged beauties without bangs. Netizens commented on the photos, “It’s already beautiful by looking at the face,” “All is so beautiful can’t really pick the number one,” “No need heavy makeup is also beautiful,” and so on.